Loss of Breath: The Unfinished Life and Death of Edgar Allan Poe, written and directed by Wesley Savick, with Ali Maynard, Assistant Director; Jake Marino, Assistant Director, Roxanna Myhrum, Puppetry Coach; Sarah Nolen, Puppet Design and Construction; Richard Wadsworth Chambers, Set Designer; Micaleen Rodgers, Assistant Set Designer; Leslie Held, Costume Designer; Jeff Adelberg, Lighting Designer; Gracie Libby, Production Stage Manager; Rory Lambert-Wright, Sound Designer, and Ross Gray, Thomas James, and Kaleigh Ryan, Assistant Stage Managers, runs November 15-18, 2018 at the Modern Theatre at Suffolk University. 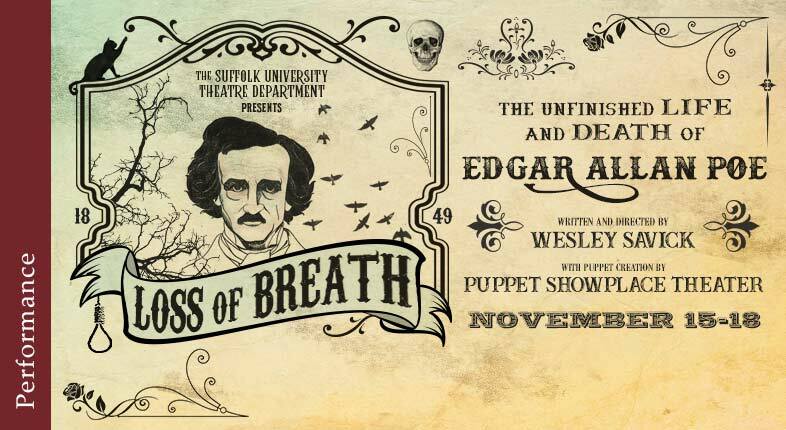 Loss of Breath is an original play at Suffolk University that goes far beyond a college production, to one that should be funded and toured. It’s based on the life story and works of Edgar Allan Poe, the 19th century horror author and possibly the oldest American author whose works are still popular today. Poe’s approach to horror was psychological rather than gross or cheaply startling. He would slowly draw you in. This play does the same, with a broad range of compelling drama that ranges from genuinely funny to genuinely scary to genuinely deep and thoughtful. The first act interweaves a story from Poe’s life, which involves poverty and deathly illness, with two of his works, Annabel Lee, Loss of Breath, and The Masque of the Red Death, a brave choice of lesser known but strong works. Then the second act connects the story to modern day. The show features actors as well as puppets. Puppets, which are known for simplistic kids’ shows, are instead creatively used to build both the comedy and the horror of the show. Designed by Sarah Nolen of Puppet Showplace Theater, the puppets, most life-sized, are held by actors, thrown around the stage, or dangled from above. The head and body of Poe’s puppet can even be separated to create a surreal insanity. With Poe’s puppet, two men speak the lines, creating an eerie dissonance. Another is a Day of the Dead type skeleton. Puppeteers sometimes blended into the background, but at other times were integrated into the action. A black, hand-held fan is symbolic of a crow that flies around the stage. It’s not just effective but also beautiful. It’s remarkable how much they do with a small stage and limited set design. There’s a carnival show. There’s haunting music and a one-way window. Cast arrange chairs to simulate riding a train. There’s an echo effect for a ghost. The show is packed full of innovative stage work and special effects like this, adding powerfully to the screenplay and acting. Physical humor is also strong in the show. Actors come into the audience holding maggot puppets to simulate death. Blood pouring from the throat is shown by unrolling a red ribbon from the mouth. There’s a gag where an actor reaches for a tree branch that becomes a skeleton’s arm. There’s a gag where giant objects are produced out of something tiny. The play takes a new form in Act II, becoming more thoughtful, surreal, and even more scary, though without much segue from or connection with what proceeded it in Act I. Written with influence from traditional Japanese Noh drama, it centers on the mystery of what happened to Edgar Allan Poe in the ten days before his death. Anastasia Bolkwadze is stunning as a ghoul who never blinks. In the same way that fashionable clothing can look silly unless you have the confidence to pull it off, Act II is full of tough dialogue that she sells as deep instead of cheap. Strangely, all of Act II takes place under full lighting, but she has a physical presence that conjures the otherworldly, haunting you in broad daylight with tension that stretches instead of collapses. That is a real challenge and an omen of a student actor with a bright future. Kudos also to Justin Peavey, whose job is even harder. Just as a comedian needs a “straight man”, someone whose reactions highlight the awkwardness of comedy, Peavey in Act II pulls in the audience with his responses to the horror of what happens. His portrayal of a weak-willed professor has layers that connect the world of the real with the world of the strange. As a result, when Act II takes a plot twist, it is both justified yet unexpected: the perfect surprise. A few nitpicks are possible. One scene with whispers makes great use of a microphone, but the rest of the play is simply spoken loudly. Some actors projected their voice dramatically, but others just shouted. Giving microphones to every actor, even on a small stage, permits more nuance and balances sound levels better. The puppet of one woman in Act I was too small (a child?) and perhaps I missed the line of dialogue explaining that she was Poe’s wife. The puppet mouths didn’t move, impeding the suspension of disbelief one needs to look away from the puppeteers. Some of the segues in this complicated play with many plot lines, for example the segue into The Masque of the Red Death, were too abrupt for an audience unfamiliar with Poe to follow. Act II was too brightly lit and its Japanese influence seemed disconnected from the theme of Poe. Still, it’s exceptional for an original play by a student cast whose entire run is a single weekend to come across as such a polished production. It’s an accomplishment that every fan of horror should see, and I hope it gets funded for an extended run or to tour. I’ll give Loss of Breath an easy 5 stars. For more, see Loss of Breath on the Modern Theatre website.